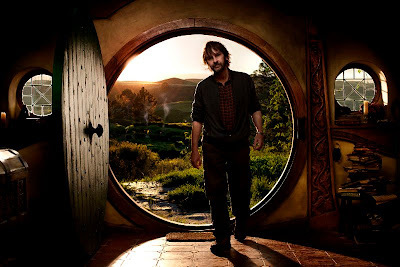 The first production video for The Hobbit has been released on Peter Jackson's facebook page. It is over ten minutes long and features Peter Jackson doing a small tour of some of the sets and facilities of the production. Those who have watched the making of for the Lord Of The Rings films will recognize some familiar faces from the cast and crew in the background. I gotta say that watching this got me back to my earliest geek years and gave me goosebumps. I am really excited that this is finally happening! This is very exciting! The Hobbit was the first book I read back when i was 9-10 years old and I immediately fell in love with the middle earth lore. It is amazing that after all those years i get to see a film about it. I fully trust Peter Jackson's vision on it. In LOTR trilogy he proved that he can make an excellent job. The artistic consistency of LOTR trilogy and the Hobbit film certainly helps to keep the illusion.